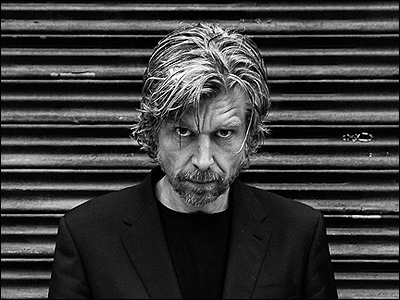 In his emphasis on everyday objects, Knausgaard is like a man in the dark fumbling around for physical reference points as he tries to find his way to the light switch. The flatness of his style is paradoxically infused with the very “uncontrollable longing” for the past that compels the undertaking, present in its very absence. Given the impossibility of reliable recollection, the listing of physical coordinates—kitchen utensils and clothing, the innumerable family meals whose constituent parts are so pedantically itemized—is a way of anchoring his writing in the real, minimizing the inevitable distortions and transfigurations of literary style. Yet rather than a naïve quest for transparency, the underlying premise of this approach seems to be a deep mistrust, perhaps even a sense of shame towards writing. Like ripping off a band-aid, Knausgaard approaches narrative writing as a necessary evil, the more tolerable if performed quickly and unceremoniously. 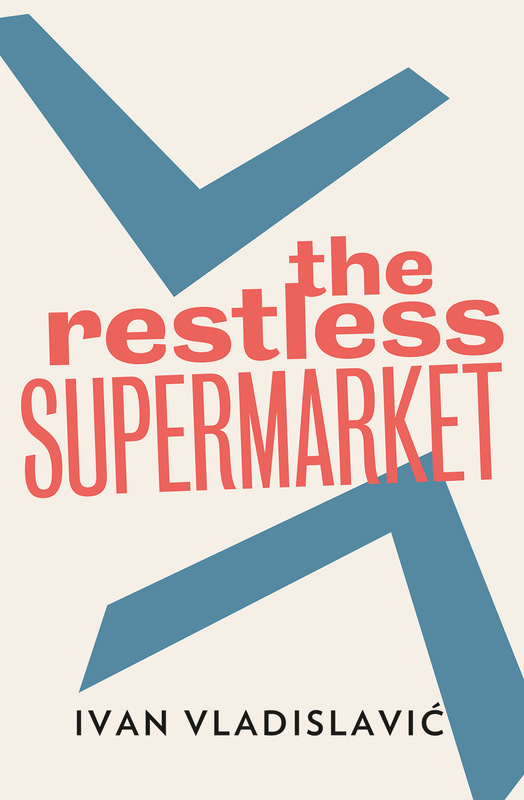 Narrated by the cantankerous Aubrey Tearle, a retired proofreader of telephone directories with a penchant for verbosity and an evangelical mania for linguistic propriety, The Restless Supermarket is among other things a remarkably sustained act of ventriloquism. A self-styled guardian of the word-hoard, Tearle sees the “declining standards” of linguistic propriety in a South Africa on the cusp of revolutionary change as not only an affront to intelligibility, but also continuous with a wider decline in “standards of morality, conduct in public life, personal hygiene and medical care, the standard of living, and so on.” Brandishing his holy scripture, the Oxford English Dictionary, Tearle is on a quixotic quest to “correct” a South Africa in a period of flux; narrated in the final years of the century as it “declines to its conclusion,” the novel’s main events take place in late 1993, on the eve of the birth of the new South Africa. Days Of Heaven sits at the intersection of early and late Malick, retaining some of the cohesion of Badlands while pointing the way to the more ruminative style ofThe Thin Red Line, The New World and The Tree of Life. Billed as PT Anderson’s ‘scientology film’, The Master is really an enigmatic melodrama about everything and nothing. This is its strength, in a way, but also ultimately its weakness. Continuing in There Will Be Blood’s vein of hammed-up thespian intensity, like that film The Master focuses on two larger-than-life characters. Freddie Quell is an emotionally damaged WW2 veteran and wildly self-destructive drinker, whose benders involve alchemising lethal moonshine from ingredients like cough syrup and (literal) rocket fuel. However, most of the pre-launch hype has surrounded his counterpart, the bombastic, pseudo-messianic shyster Lancaster Dodd, inspired by South Park’s L. Ron Hubbard. Quell falls under the influence of Dodd by chance, having wandered onto a cruise ship rented by Dodd’s cult, during the course of one of his binges. The two strike up a strange mutual dependency, with Quell falling under the spell of Dodd’s charismatic oratory and cod-spiritual guidance. Quell’s priest, psychoanalyst and surrogate patriarch in equal parts, Dodd is also in some ways a kindred spirit and mirror image. In a strangely triangulated pact, he feeds off Quell’s childlike reverence, growing ever more dependent on Quell’s dependency. Dodd also, it is hinted, develops something approximating Quell’s physical dependency for the potent cocktails he concocts. Just as There Will Be Blood concerns the intoxicating effects of the will to power, religious fervor and primal animosity, The Master concerns the parallels between those of belief, personality, and alcohol. Both films make more sense if you bear in mind that, in one way or another, the characters spend most of their time completely wasted. As is immediately discernible, then, this is not Anderson’s personal critique of the tenets of scientology, an exercise that would be unlikely to merit two and a half hours of any thinking person’s attention. The cod-philosophy that Dodd spouts is clearly spurious, but its details are arbitrary and only briefly gestured at. Anderson is clearly interested in belief and where it comes from, but he is primarily concerned with the human compulsion, need, manipulation, desire and force of personality that creates it, not the details of that which is believed. Even when a rare, educated listener challenges Dodd as he spouts his ludicrous metaphysics, the focus is on the human content of his violent and paranoid reaction, rather than the truth-content of the objection. If this is a character film rather than an issues film per se, that is not to say that Anderson does not attempt to locate his characters within the specifics of their time and place. Indeed, the film is full of gestures towards wider themes. Quell is a lost boy who has no idea how to take control over his life having been cast back into civilian society after the war (though the latter is never shown). His search for a surrogate family is underwritten by his own rootlessness, his father having drunk himself to death and his mother having died in an insane asylum. He makes a living for a time by taking family photographs in a shopping centre – the ultimate symbol of America’s mid-century crisis of spirituality – creating endless reconstructions of the idealized nuclear unit from whose authentic reality he is alienated. Yet if Anderson intends Quell to embody some sort of wider truth about the postwar condition, this intention is at odds with Joachim Phoenix’s caricature posturing – which is not to say that it isn’t an extraordinary performance. In many ways it is a remarkable display of method-acting rigour. Indeed, Pheonix’s sneering, maniacal intensity recalls that of Klaus Kinski in Werner Herzog films like Aguirre, The Wrath of God, Fitzcarraldo and Woyzeck. Yet the uses to which Herzog and Anderson put this sort of performance are very different. Herzog’s Kinski films are defined by Wagnerian excess – explicitly, in the case of Fitzcarraldo. 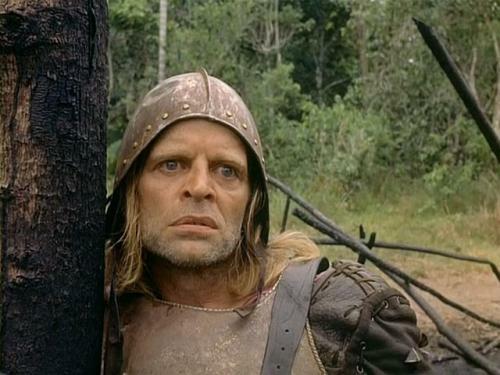 The histrionics of Kinski’s performances are matched by Herzog’s overreaching metaphysical bombast. Their elemental intensity recalls classical tragedy, serving to dissolve the individuality of Kinski’s personas and elevate them to the realm of archetype. Herzog’s purpose is not to create a sense of empathy or three-dimensional believability in the case of Aguirre, any more than Homer’s is in the case of Achilles. Anderson is interested in filming similarly spectacular and histrionic performances from both his leading men, but he also seems to want to domesticate them in a way in which Herzog has no interest. This creates a conflict. Anderson seeks to examine Quell and Dodd and tap into their interiority, understanding the human motivations that underpin their relationship. But their performances are so external and aestheticized in their studied thespianism that they remain remote. Quell and Dodd are neither believable enough to be fully human, nor representative enough to be compellingly symbolic. They neither fully achieve nor transcend the particular. The result is caricature. 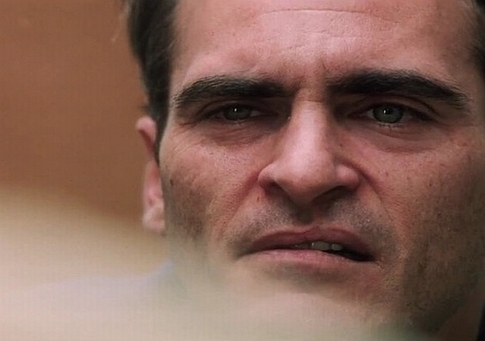 There is much to admire in The Master, but it is not a film that ever achieves more than the sum of its parts. Indeed, the main impression I left with is that Anderson is an interesting and talented director who has fallen into the trap of believing his own hype. Profundity, much like humour, is something that can’t really be forced. 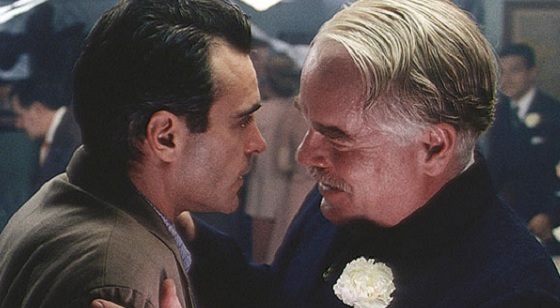 The earlier films that launched Anderson’s reputation, Boogie Nights and Magnolia, are triumphs of style, offbeat humour and imagination, but they are not works of any particular artistic or philosophical depth. They are films that are not about anything per se; they merely are – in a way that is unforced, singular and vital. The Master, in contrast, is a work that in its desperate striving to say something meaningful about life ultimately fails to attain a life of its own. 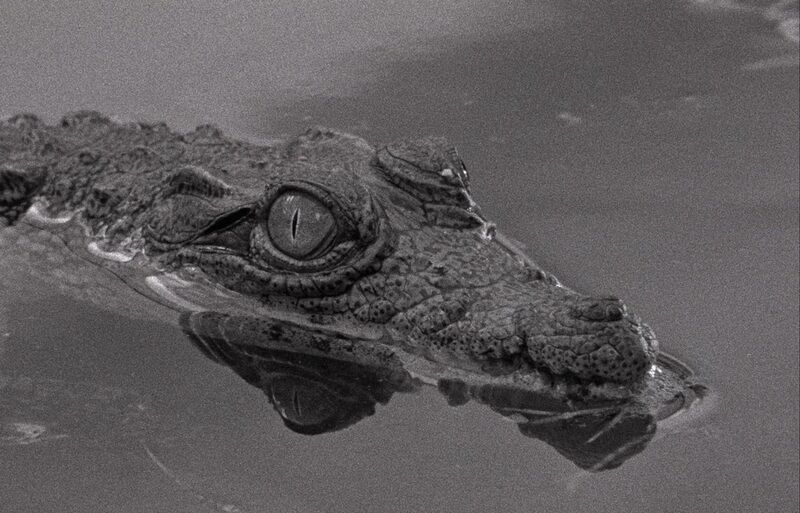 The latest offering from Portuguese auteur Miguel Gomes, Tabu revolves around a series of unresolved oppositions: realism and romance, fact and fiction, the metropolis and the colony, the internal and the external, the narrator and the narrated. Not only is the film structured around thematic contrasts, formally it is split into two bipolar halves: present and past or, in its own literary terminology, Paradise Lost and Paradise. The former is a prosaic study of urban alienation, while the latter is a self-consciously poetic melodrama set in colonial Africa. The thread that links the two sections is Aurora, a senile old lady who gambles away vast chunks of her fortune and rambles semi-coherently about filial plots, the machinations of her taciturn maid Santa, and escaped crocodiles. 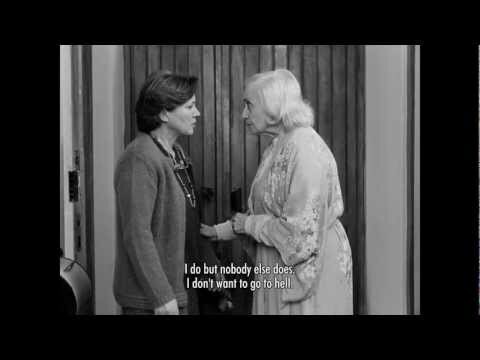 We encounter her through the eyes of her neighbor Pilar, a lonely middle-aged spinster and Catholic do-gooder. Along with Santa, they form the central triangle in a low-key urban character study that resembles a less dramatic Haneke or a less wry Kaurismaki. The themes are all there: the impossibility of communication, the atomization of modern life, the arbitrariness of a faithless world, the failure of multiculturalism. The characters are ideas with names. Santa (saint), an impoverished African immigrant, remains as utterly inscrutable as her postcolonial generic precedents would lead us to expect (she even secretly reads Robinson Crusoe). Pilar’s (pillar) Catholicism insulates her against the meaninglessness of her lonely existence. The surreal poetry of Aurora’s demented monologues provides a contrast to the unrelenting prose of daily life. All of which, while not without its merits, on first viewing errs on the side of obviousness and didacticism. However, the film is flipped upside down by a second section that could scarcely be more stylistically incongruous. An elderly stranger, Gian Luca Ventura emerges like a ghost from Aurora’s past and recounts to Pilar the tale of their histrionic romance, set at the foot of the remote African Mount Tabu. Replete with elemental passion, shattered taboos, elopement, murder, betrayal and tragic separation, the tale breathes life back into the dead themes whose very absence haunts the opening section. The world is re-enchanted before our eyes in a manner whose potential spuriousness we are more than willing to temporarily forget. The contrast is as much stylistic as thematic. The neo-Bressonian minimalism of the opening section gives way to an unashamedly lyrical homage to the silent era, all aestheticized black and white shots of verdant mountainsides in the setting sun and smoldering close-ups of the youthful star-crossed lovers. The section is soundless other than the atmospheric hum of crickets and the disconnected voiceover of the now-elderly protagonist telling the story at Aurora’s wake in Lisbon. Reviewers have invoked Terrence Malick as a reference point, and the magic-hour lighting, leisurely panoramas and enigmatic voiceover would all seem to suggest his influence. 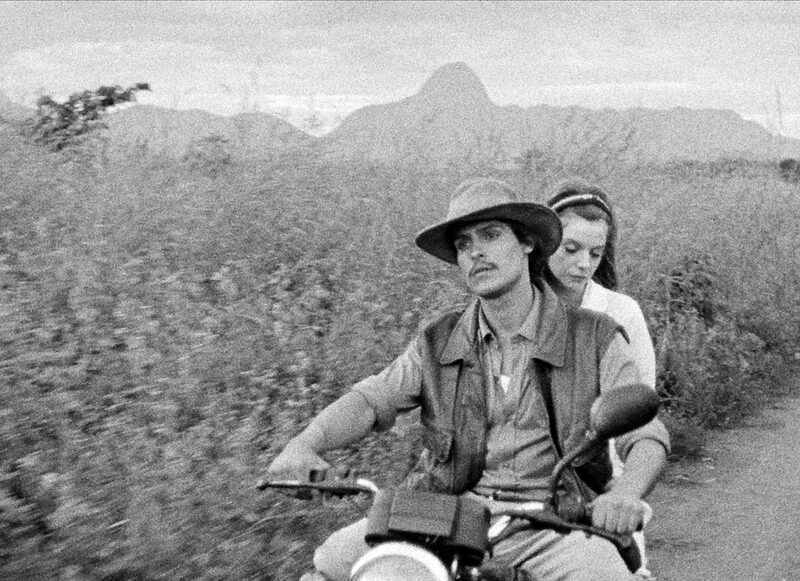 The unconfirmed relationship between word and image serves as the formal crux in Malick films such as Badlands and Days of Heaven, and Tabu utilizes a similar structural instability. We do not know whether what we watch in the second half is a visualization of the events from an omniscient perspective, a projection of Gian Luca’s memories as he sees them in his mind’s eye, as they are transfigured in the romance-starved imagination of the listening Pilar, or even a commentary on the way we the audience might perceive his memories to look because of our own preconditioning by the very cinematic norms and clichés it employs. In a sense it doesn’t matter – the effect lies in the uncertainty. If the section’s aesthetic were merely intended as homage to a bygone cinematic era we might dismiss it as mere trainspotting or self-indulgence. But the romanticizing cinematic language is problematic. On the one hand it serves to poetically exaggerate and universalize its themes in the manner of classic middlebrow melodrama. But on a more subtle level it emphasizes the potentially violent subjectivity of nostalgia. Stripped of their sentimental baggage, the events it depicts are largely destructive, culminating in the hastily covered-up murder of an entirely undeserving victim. Like the ironically fairytale aesthetic that disguises the violence of Badlands and Days of Heaven, this treatment conceals the nature of the events it describes. The second section, then, provides a mythic counterweight to the drab social realism of the first, which purports to merely show things to us ‘as they are’. But this is rather more than dramatic relief or escapism. For one thing it calls into question the limits of cinematic realism, underscoring the gap between appearance and quiddity. Just as the characters in the first half are unable to really communicate or empathize with one another, our window into Aurora’s tumultuous past – outrageously distorted or downright untrue though it might be – serves to emphasize the inauthenticity of appearance. Though the realism of the first section pretends to document concrete reality, the second half shows that it has communicated nothing of its characters’ inner lives. The actual nature of the present is as fugitive and hypothetical as that of the past. If the purpose of the second section were merely to correct our initial reading of the first with a revelation of the past, while juxtaposing the prose of the present with the poetry of nostalgia, it would have run the risk of triteness. Yet its complexity stems from its ambiguous relation to any notion of objective truth. By retaining an uncertain relationship between the words that form the historical data of the narrative (themselves potentially unreliable) and the aestheticized images that relay it to us visually, Tabu refuses to give us an authentic version of events to fall back on. Indeed, the truth of the film lies somewhere within the very contradictions inherent in its opposing forces. The poetic truth of the second section is as selective, questionable and incomplete as the prosaic truth of the first. The whole remains inaccessible. Ultimately Tabu serves as a monument to the glorious futility of any attempt to impose a narrative upon the world. ‘Every American hungers to move’, writes John Steinbeck in Travels With Charley. He may be right, but by and large they hate to walk. The quintessential mode of conveyance in the US novel is the vehicle: by wagon for Faulkner’s mourners or Steinbeck’s wage-slaves, by boat for Melville or Twain, by car for Kerouac, Hunter S. Thomson or Tom Wolfe, by motorbike for Robert M. Pirsig, or on horseback for Larry McMurthy or Cormac McCarthy. When McCarthy strips his characters of a ride in The Road it feels like a symbolically loaded statement. Back in the Old World we are rather more tied to our bipedal roots. Indeed, if many of the great American novels are in one way or another about road trips, the modern European novel is similarly obsessed with walking: from Proust’s miasmic peregrinations around Combray, to Doblin, Bely and Joyce’s more metropolitan flaneur-isms, or more recently Sebald’s psycho-geographic ramble around East Anglia in The Rings of Saturn, which has contributed to a new UK-based walking craze through the likes of Iain Sinclair, Will Self and Robert Macfarlane. (Beckett, as usual, defines this trend by negation, constraining his characters to more stationary forms of existential bewailment. If movement is allowed, it tends to involve either an ignominious end in some distant roadside ditch or, at a push, dragging oneself along face-first in the mud). This transportational preference has its formal and thematic correspondences. The macho, open-road tradition of the Great American Novel privileges romantic excess, the formless howl rather than the European well-wrought urn. If the American novel has retained something of the frontier mentality, we crowded Old World-ers are more interested in constraints, both actual and formal. The US has Catch 22, Gravity’s Rainbow, Underworld and Infinite Jest, Europe has the nouveau roman and OULIPO. If American literature is about discovery and new beginnings, Europeans are crushed by the weight of history. American idealism throws off the paralyzing subjectivist shackles of post-Enlightenment thought and hubristically gropes for the thing itself, while Old Europe turns ever further inward, locked into its own ruminations on the writing process and the suffocating grip of worn-out categories of being. While the American novel aspires to be – in the words of Saul Bellow’s narrator Charlie Citrine – ‘magically, cosmically expressive and articulate, able to say anything’, the European novel is preoccupied with the impossibility of actually saying anything at all. In fact, if there is another quintessential subject for the modern European novel alongside walking, it’s writer’s block. These twin topics are the backbone of Robert Walser’s masterfully enigmatic 1917 novella The Walk, as they were in some ways the defining states of his life. 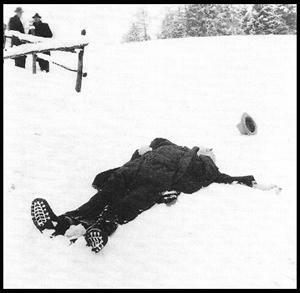 His predilection for the former is immortalized in the eerie photo of his corpse, collapsed in the snow during the course of one of his perambulatory excursions from the psychiatric hospital in which he spent his final years. And writer’s block – that defining symptom of modernist anxiety from Hugo von Hofmannsthal to Kafka, Beckett and Pessoa – is one of Walser’s enduring subjects. Just as one of his most important descendants Thomas Bernhard’s novels tend to consist of the thing that his protagonist does or writes instead of writing their magnum opus, the narrator of Walser’s The Walk imagines himself out in the world on various trivial matters of business, on an excursion he has taken in order to cure his writer’s block. Walser establishes an opposition between the world as Apollonian lightness and the text as Orphic darkness. The narrator may feel inspired to communicate his experience of this world of the senses, but – as he reminds us by foregrounding the act of composition – he can only do so by returning to his ‘room of phantoms’ and entombing it within another text. We can recognize in this the classic contradiction facing the modern European author: the chasm between experience and representation, referred to by the theorist Rene Wellek as the ‘ontological gap’ separating the world and the text. 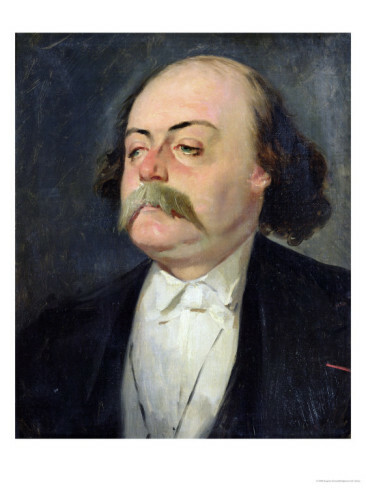 Baudelaire’s painter of modern life may be a flaneur or ‘gentleman stroller of city streets’, but the writer who converts this world into black marks on paper is a solitary creature locked in deadly battle with his own failure to recreate it. “Real books”, writes Proust in Time Regained, “should be the offspring not of daylight and casual talk but of darkness and silence”. Literature may aspire to communicate some of the instantaneity of experience, but somewhere along the line it has lost faith in the validity of its own methods of doing so. While a sense of the impossibility of reclaiming the past through writing resonates beneath The Walk, it is at least superficially concealed by comedy. Indeed, the abject failure of Walser’s prose to recreate anything resembling the world outside of the text is the book’s running gag. The formal design of the novel functions in part as a liberating device that allows Walser to write joyously and exhilaratingly badly. His style is a cascade of self-consciously literary adjectives, balanced somewhere between heavy-handed and absurdly overwritten. A lady he encounters on the stairs “presented to the eye a certain pallid, faded majesty”; a passing scholar is “Incontrovertible power in person, serious, ceremonial and majestical”, his gait “like an iron law” and his hat “like an irremovable ruler”. Yet in these adjectives we hear not the objects they describe, but the groping for literariness: when does one ever think these things, encounter these sentiments? We can hear in much of this curiously gauche posturing a parodic echo of the polite Victorian realist novel. The post-Flaubertian stylist is a tortured syllable-counter endlessly searching for the bon mot, the mysterious confluence of euphonious vowel and well-weighted cadence that will momentarily exalt the quotidian and transport his reader to the spine-tingling Nabokovian realm of aesthetic bliss. 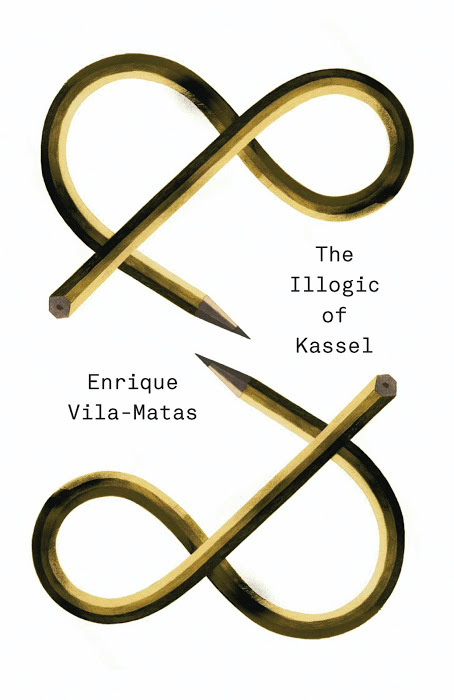 Yet Walser’s style and structure is directed at throwing this romantic process into comic relief, exposing the absurdity at its core. The writer toils away in his ‘room of phantoms’, desperately disgorging verbiage onto the page in his doomed attempts to transform the mundanities of experience into great literature. Yet all that emerges from it is artfully framed failure. 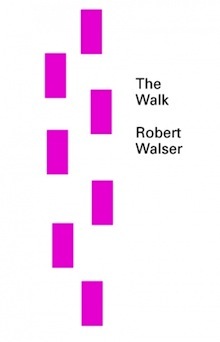 If Walser’s comic dialogue with the language and gestures of literary convention is at times gleefully impish, it would be a mistake to regard The Walk as anything so self-evident or easily categorized as satire. Its vision is too opaque, its meaning too enigmatically unfulfilled, its contours edged with darkness. Walser was one of Kafka’s favourite authors, and the oneiric seamlessness of Kafka’s more surreal narratives such as The Castle or Description of a Struggle is immediately recognizable. The narrator moves from one distorted interaction to another in a kind of lucid dream, a liminal state that seems to draw from both conscious and unconscious, blurring the straight lines of the former with the associative fluidity of the latter. The persona of the narrator evaporates within this mnemonic haze, the self who took the walk irreconcilable with the self who attempts to recreate it. Indeed, while Walser’s narrator only hints at the malaise that underpins his comic riffing, the more the discord builds the more we come to realize that it conceals a kind of desperation. Stripped of its tragi-comic verbal plumage, what really takes place in Walser’s story may be expressed as something like this: a writer, faced with the despair of his untouched manuscript, rushes out into the world in search of inspiration. However, all he finds there is bourgeois mundanity: a bookseller peddling popular trash, a sycophantic bank clerk, a garishly painted butcher’s shop, an overbearing lady patron. Back in his miserable room he attempts to mobilize the rhetoric and devices of literary history to infuse this meaningless series of events with grandeur and significance – but somehow the spark fails to kindle. Perhaps the world was once an enchanted place full of great and significant happenings, the raw material that the writer need only sculpt into literary form to produce great art. Yet somehow this magic has disappeared. When he tries to write literature, what comes out is not the world, is not him, is not life, at all. Indeed, all he can express is literature’s absence from the world. The great artist, so the cliché goes, attains a surrogate immortality. But at the end of the story we leave Walser’s narrator enveloped in nightfall: the darkness of a world and a self that cannot be reclaimed, that is gone forever the instant it has passed. Note: Originally published (in German) in 1917, The Walk is reissued by New Directions. Christopher Middleton’s classic translation has been updated by Susan Bernofsky to correspond to a rewrite of the story that Walser himself considered the definitive version.